The next day (or a few days later), after everything has had a chance to dry, it's time to start making the tree! To do this, I have a long dowel that I measured next to my cake to ensure I liked its height. I trimmed my dowel so that it measured about 15 1/2 inches in length. I purchased inexpensive wire from my local Home Depot to use as armeture wire. 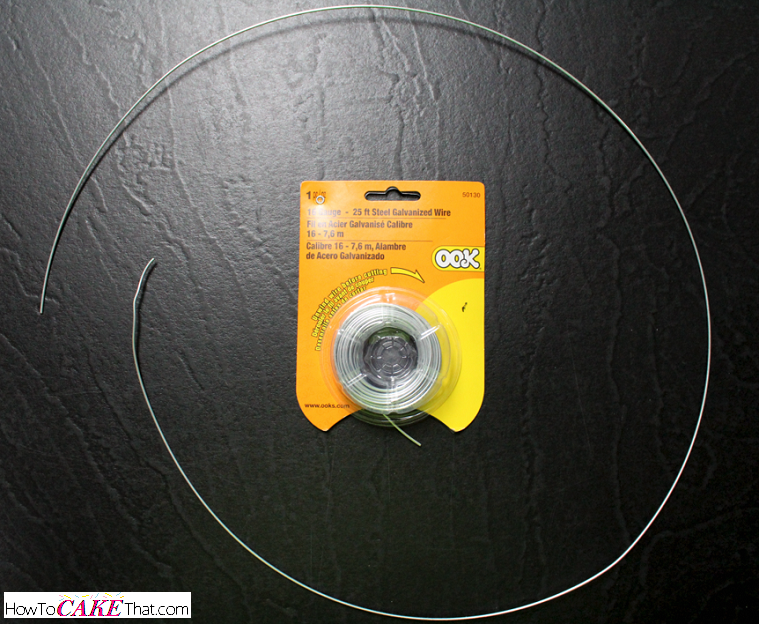 This is OOK brand 16 gauge - 25 foot steel galvanized wire. 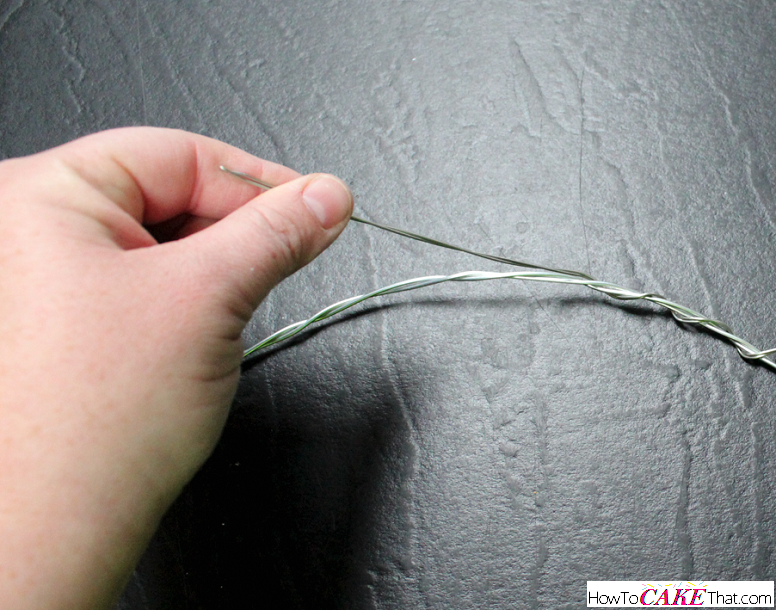 This is a very strong wire... perfect for holding up a heavy chocolate ornament ;). And because it is so strong, it is difficult to work with. Just wanted to give you a heads up ;) Here i have trimmed a piece long enough to be folded in half and used as the top of Charlie Brown's Tree. 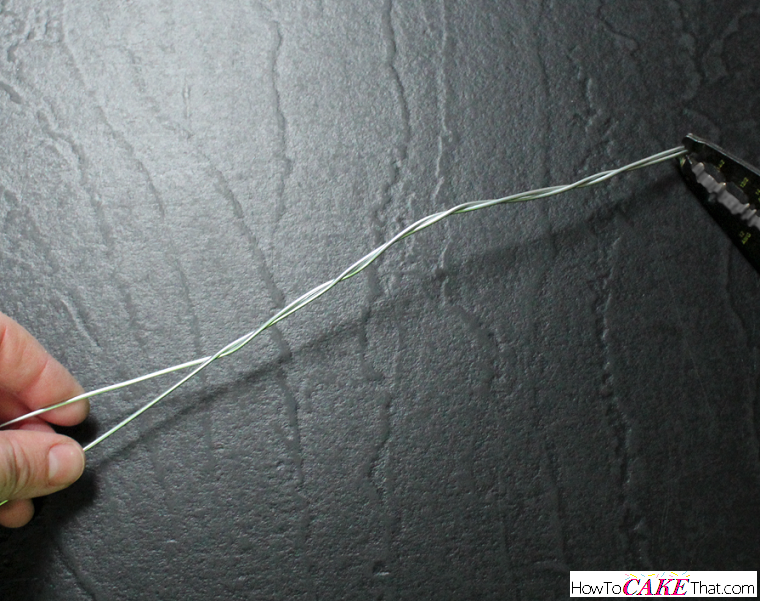 Using a pair of pliers, I pinched the wire in half, then twisted the ends around each other to make a thick strong wire. 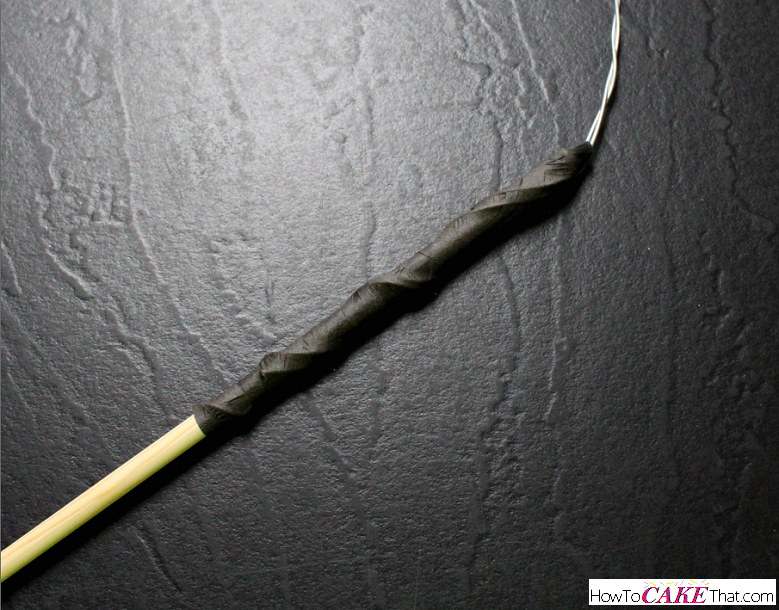 Then I wrapped the end of the wire around the wooden dowel. 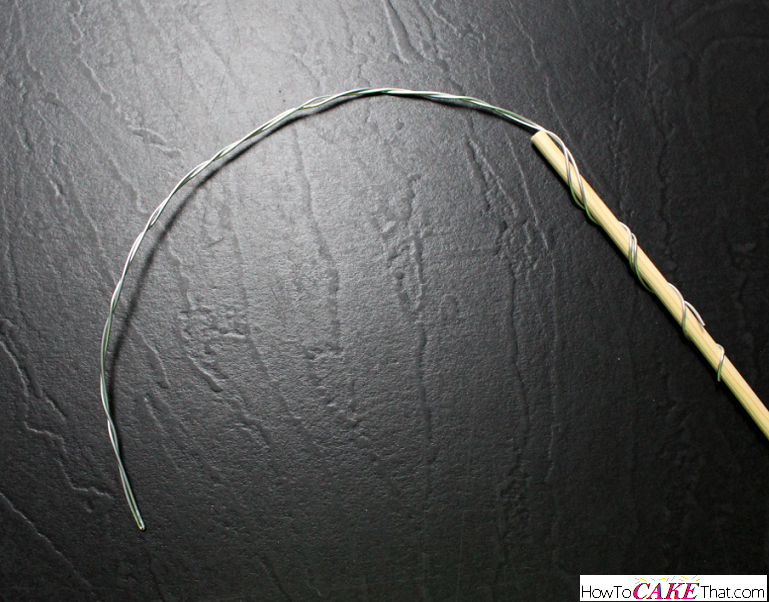 Then I wrapped brown florist tape around the wire and dowel to secure the wire in place. Then I used the same method of folding wire in half and wrapping the ends around themselves to create the tree's branches. 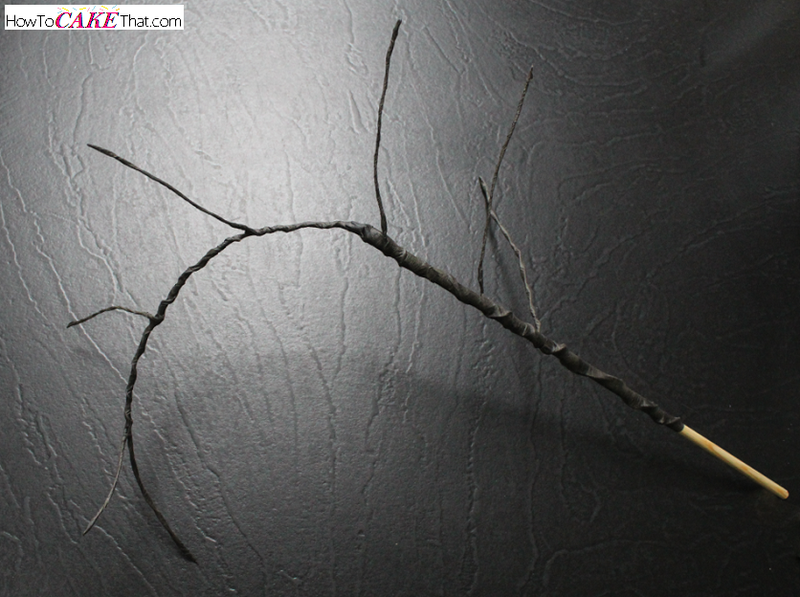 This time I am using lighter and thinner 20 gauge florist wire to create these branches. Once I had added enough branches, I wrapped the entire tree (except for about 4 inches from the bottom) in brown florist tape. Now it's time to create a spot for the tree to sit! Use a ruler to find the exact center of the cake base. Use a pencil to mark a dot right at the center. 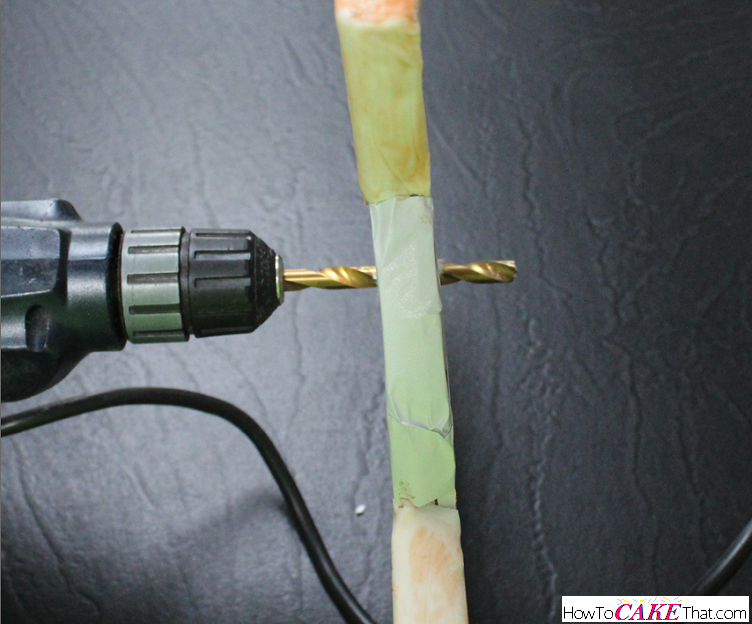 Then fit a drill with a spiral drill bit in the exact same width (or just a hair smaller) as your wooden dowel. 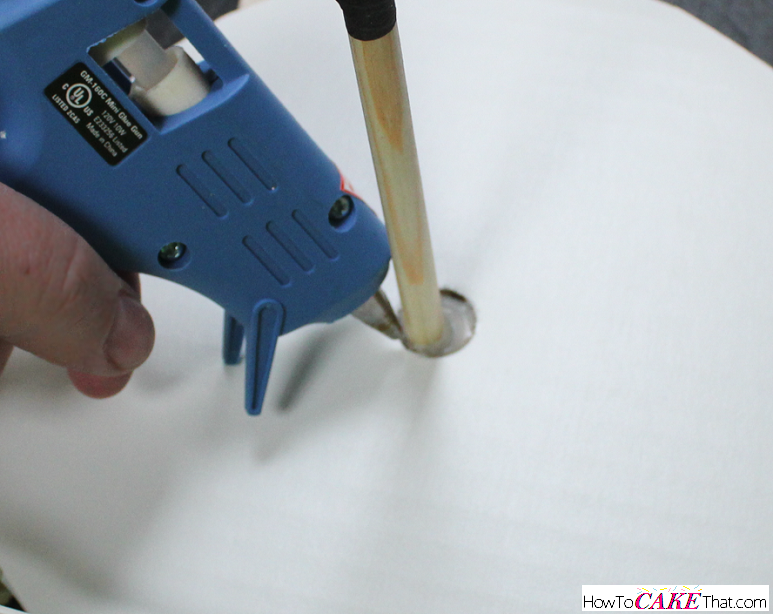 Drill a hole completely through the center of the cake base. 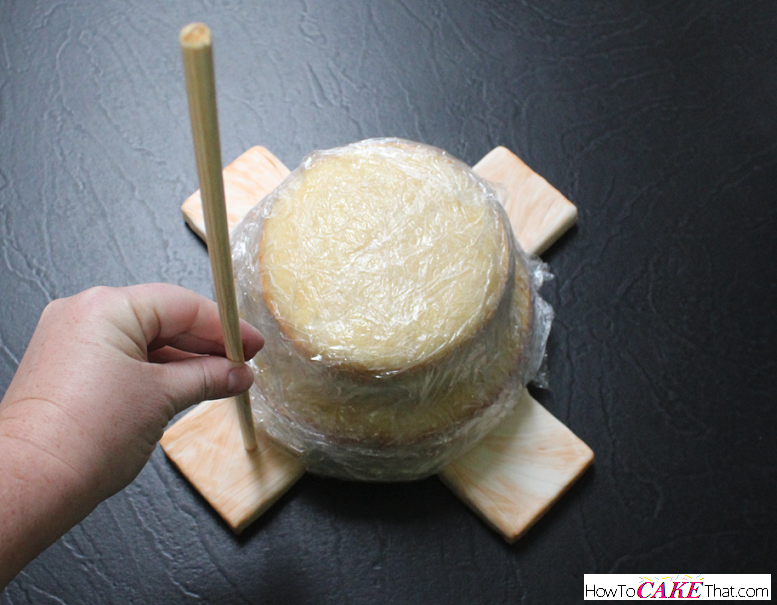 Then, to keep the tree dowel from sliding through the bottom of the cake base, use a hot glue gun to glue a small cardboard cake round to the underside of your cake base. 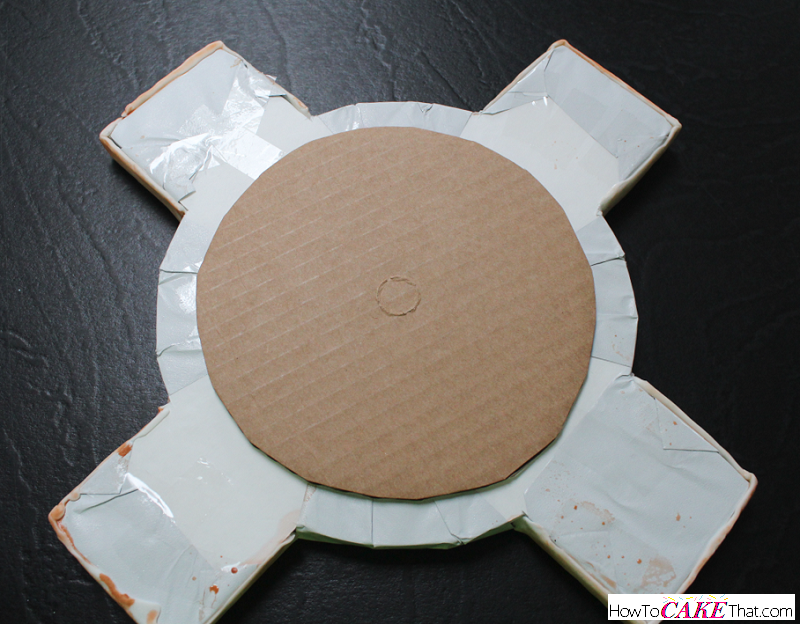 Next, punch the center piece out of a Wilton 8" cardboard cake round and add hot glue to the underside. Flip the cake round right side up and secure it to the center of the cake base. This will give the cake a nice clean surface to sit on. 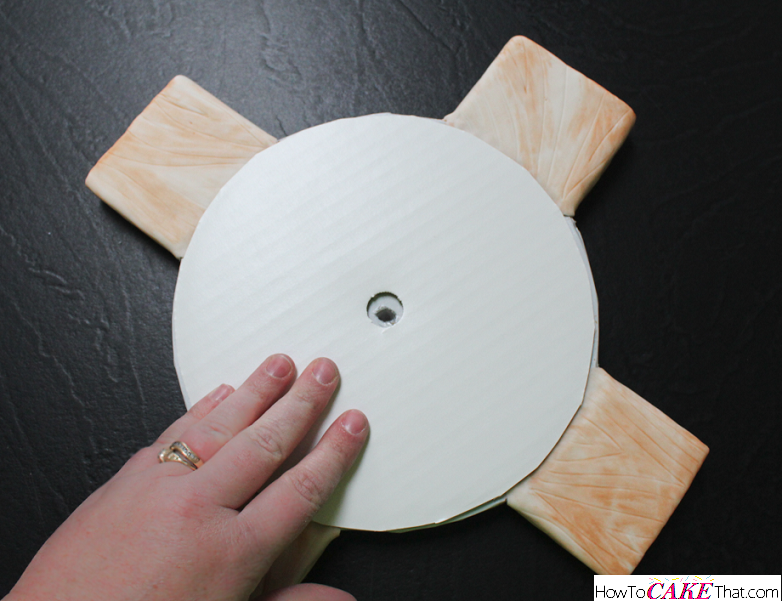 Squeeze a bit of hot glue down inside of the drilled hole. Then quickly insert the bottom of the tree. Hold the tree in place. 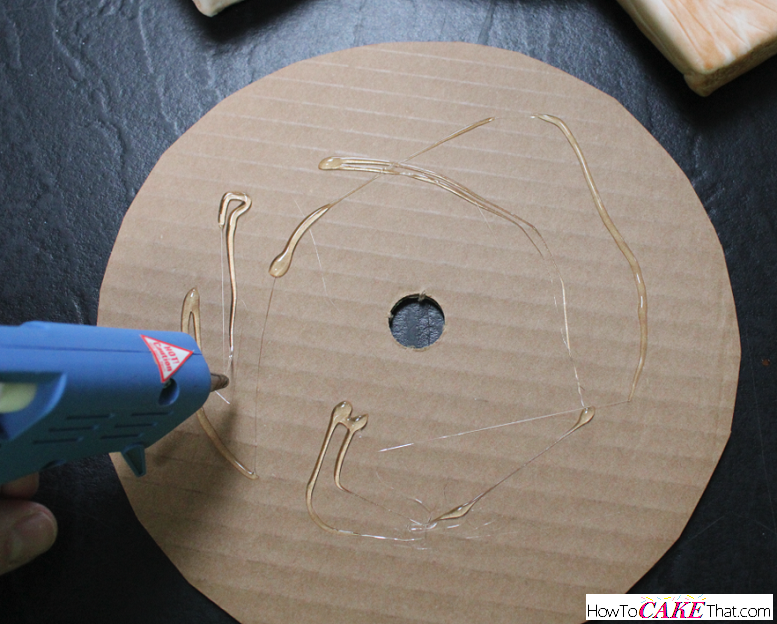 Then fill in the gap with hot glue to ensure the tree will sit nice and secure! 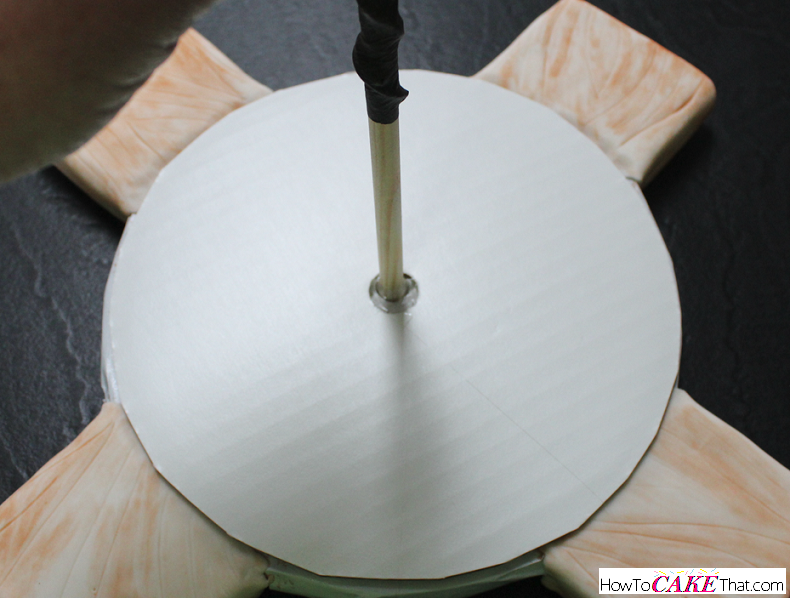 Hold the tree in place for a few minutes, until the glue has cooled and hardened.